Home > Conference Reports > Questioning Power? The years 2017 and 2018 present the Left with multiple significant anniversaries. Hot on the heels of the centenary of the Russian Revolution are the international Marx200 events to commemorate the birth of Karl Marx on 5 May 1818. The more recent past becomes alive again in the critical remembrance of ’Global1968’, commemorating the student revolts of half a century ago. As the country of Marx’s birth (and one of the centres of the 1967/68 activism), the German Left is challenged perhaps more than most to respond to these significant dates – not to mention even that the country’s political history also has the centenary of the German ‘November’ revolution coming up later in the year when on 9 November 1918 Berlin witnessed the social democrat Philip Scheidemann’s declaration of the German republic and the end of imperial rule, followed a mere few hours later by the pronouncement of a socialist German republic by Karl Liebknecht, a founder of the Spartacus Bund and the German Communist party (and who was murdered two months later on 15 January 1919 – on the very same day his comrade, the great Rosa Luxemburg was also killed). No wonder, a joke has been making the rounds among activist intellectuals in Berlin that a year-long sabbatical from their usual duties would be needed to read, study, write, and act appropriately on all of these important anniversaries! What do these dates mean for Africa? In most contexts the continent does not even come up – an excellent exhibition currently on show in the German History Museum on the Russian Revolution, for instance, presents details of its consequences for countries across Europe but makes only one brief mention of the continent — in the form of an exhibit of a 1920s French right-wing poster that defamed the communists for backstabbing la nation in the colonies. Similarly, a recent publication by a German historian, dubbed ‘1968: youth revolt and global protest’ includes chapters on Paris, and on the events in the United States, Germany, Japan, Italy, the Netherlands, and the U.K. in ‘The West’, supplemented by a chapter on ‘Movements in the East’, which discusses protest in Prague, Poland and the GDR. Neither Africa, nor indeed any part of the Global South are mentioned. In conversations I’ve had with African-focused colleagues, comrades and friends over the past weeks in Berlin they have expressed frustration, time and again, that it was difficult to raise awareness on events, or consequences of these historical moments on the continent. 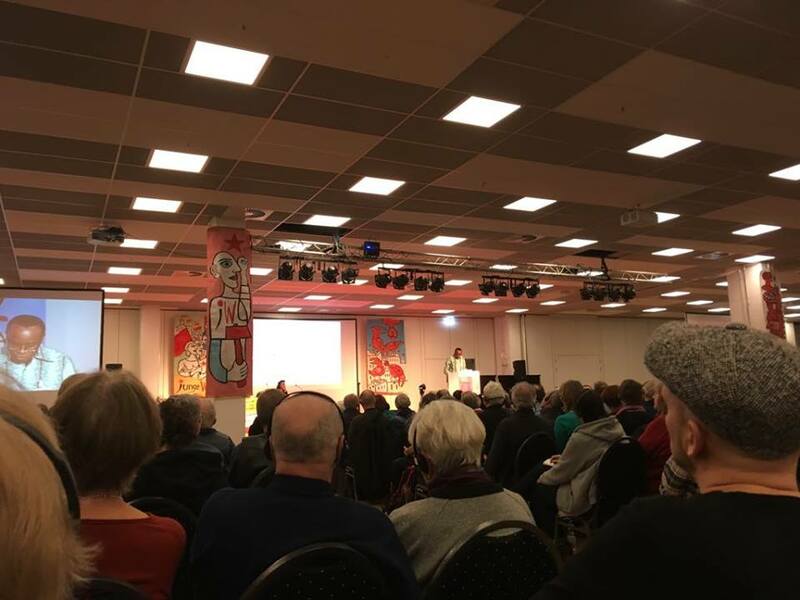 It was laudable then that the organisers of the Junge Welt newspaper’s Rosa Luxemburg Conference chose a focus on Africa for their 2018 event. The 23rd instalment of this annual event took place on 13 January under the banner ‘Amandla! Awethu! Questioning power’. According to the organisers, 2,700 people had paid the entrance fee of 23 Euros to attend the event held in a major conference hotel, and located in Berlin’s historical working-class neighbourhood of Moabit. The junge Welt describes itself as ‘left’ and ‘Marxist-oriented’. Historically it was the daily that had the highest circulation in the former East Germany, and was published in the GDR by the ruling Socialist Unity Party’s (SED) youth organisation. Now formally independent of any political party, the paper is a hub of a tendency on the left that still roots itself firmly in an affirmative memory of the GDR political tradition. This includes a particular, one may say, peculiar perspective on internationalism. The conference embodied this perspective in its peculiar contradictions and unevenness. The programme included some excellent presentations by African writers, activists and artists. The Nigerian writer and activist Nnimmo Bassey spoke elaborately and passionately about the connections between natural resources, mining, violence and ecological destruction. As a long-term activist against “big oil”, the extraction and pollution caused by Shell and other companies in the Niger delta, he certainly knew the field well. He referred to instances across the continent to demonstrate his argument about the intricate consequences of what he called “extraction without responsibility” as an expression of a logic of power, built on relationships built from colonial times, and resulting in ecological collapse. Bassey got most applause for his expansion on resistance by “communities who want to live life in dignity”, from the Niger Delta’s struggles dating back to the 1980s through to that around the Great Lakes in East Africa, and the protests of fishing communities in South Africa’s KwaZulu-Natal province today. Being a writer, in addition to his life-long role as an activist Bassey emphasised that protest movements also need to ensure that “we own our stories and tell our narratives to build bridges across the Global North and the Global South”. The audience gave him an unequivocal, well-deserved ovation for his call for a revolution on the continent, and beyond that should be fought for through local resistance and global solidarity. In the afternoon, the Ghanaian artist Ibrahim Mahama presented some of his work, and spoke about it engagingly in conversation with the editor-in-chief of Melodie & Rhythmus, the cultural magazine and sister-publication of junge Welt, Susann Witt-Stahl. Mahama, who had earlier this year participated in the German major contemporary art biennale documenta 14, works in photography, installations and performance art that impressively demonstrated contemporary artist-activist perspectives on industrial and urban landscapes, labour conditions and protest on the continent. In the conversation Mahama elaborated on his critical view of contemporary art as intervention. The last speaker for the afternoon was Achille Mbembe, the leading social and political philosopher of postcolonial conditions. Mbembe who spoke as an acute observer and critic rather than as an activist still received a tremendous reception for his radical points about both the continent as the ‘laboratory’ of global developments and the underlying conditions of the mass refugee emigration from Africa. In his presentation he placed emphasis on human mobility, and the compounding issues of safety and identity. 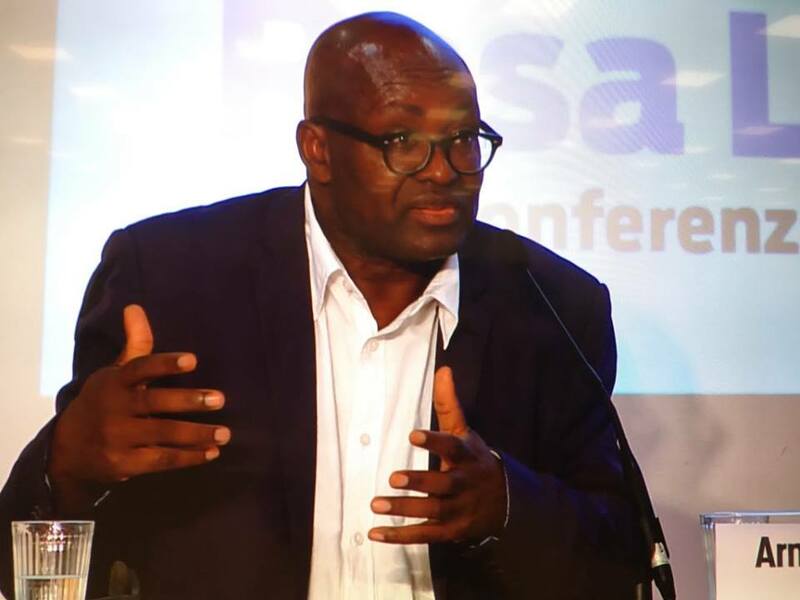 Mbembe pointed out that key among the problems of current democracy was “how to control the movement of human bodies”, which he said constituted a “key philosophical question of our time”. In this context, while not going into much detail, he suggested the need for a “borderless world”, and spoke for the abolition of borders – a phenomenon which had little historical evidence on the continent -, and presented a wide-ranging critique of the prison system. In his expansive argument he spoke about both the racism of imprisonment systems in general, and the massive landscapes of captivity, prisons and especially camps in Europe. The latter was much more of a prominent feature of the European continent than at any other time before, he emphasised, touching if ever so briefly on the German history of the 1940s. These were brilliant radical presentations by leading African intellectuals, artists, and activists. The conference had some more interesting moments, such as the – brief, much too brief – scene extracted from a new play currently on show that features the ‘official’ political persona of Rosa Luxemburg juxtaposed with her more private moments. Touching also presentations of solidarity activism with, and by Mumia Abu-Jamal, journalist and ex-Black Panther activist from Philadelphia who has been in jail for 36 years. Equally impressive, if even more emotionally touching was the brief speech by the brother of Oury Jalloh, the Ivorian immigrant who was burnt to death in a prison cell in the southeastern German town of Dessau in 2005. Until now, the family and activists demand a full investigation of his violent death. Called upon by Jalloh’s brother the hall – packed to its 1,500 seat capacity – rose for a minute of silence. Such moving moments and the passionate interventions by the invited speakers from the continent were set off however by parts of the conference that made me wonder about the brand of internationalism that guided the event. There was, for one, the embarrassingly uncritical celebration of Cuba as a model of “another world that is possible”. This sentiment was repeated over and over again by members of ‘Friends of Cuba’ activist groups from Germany and Switzerland. Cuba was presented as the socialist country that had been engaging in selfless and historically, culturally sensitive solidarity with Africa. The invited Cuban speaker, the journalist Enrique Ubieta praised Fidel Castro as “an African”, and drew extensively on Frantz Fanon’s sociological writings on psychiatry and medicine in revolutionary Algeria, thus drawing a direct analogy between Fanon’s protagonists in the Algerian revolution and Cuban doctors working in Africa. In Ubieta’s speech, the Cuban medical doctors sent to African countries as representatives of a “revolutionary medicine” closely listened to their patients in order to learn from them, and to treat them in careful consideration of their ‘culture’. His bold statement was that there were no cultural conflicts between the Cuban doctors and their African patients, “if there were any conflicts, those were only conflicts of class struggle”, Ubieta pronounced. While these unflinching claims were perhaps understandable for a representative of official Cuba, more embarrassing – to this observer – were the unquestioning, staunch endorsements and celebrations of “the Cuban people” and “Fidel”, over and over again. Cuba was the place and the history from which to learn, Fidel was the mentor of socialist solidarity, or so it was said. Following the Cuba-to-Africa presentation, the conference called for a resolution for solidarity with Venezuela, the “brotherland of Cuba” against the Latin American country’s “reactionary opposition and interference by the United States and the EU”. There was no discussion, instead the resolution was adopted without any debate, the audience was called to join the stage, which only a few did. Though most of the audience rose from their seats to chants of “Hoch die internationale Solidarität” (Long live international solidarity). The uncritical celebration of Cuba and Venezuela as models of socialist hope and solidarity made me wonder about those attending the conference. Reading the junge Welt newspaper leaves no doubt that for the editors and most contributors the end of the former Soviet Bloc and the GDR has thrown out models of another, better world, alternatives to capitalism. More than that, though: they recall the former ‘East’ nostalgically as a better world already realised. Walking around the hall I noticed that many of the audience were of an older generation (60+) and nodded approvingly to statements from the stage (made by the German organisers rather than their international guests) that “we have to insist against the capitalist mainstream that the GDR was bad” (to paraphrase the sentiment). Part of the endorsement of the former Stalinist rulers was an apparent sense of solidarity with states, Cuba, Venezuela, also an astoundingly uncritical celebration of China’s contemporary role on the continent. The latter was presented by German speakers as much as by Ding Xiaoqin, an economics Professor from Shanghai who spoke, as the true alternative and hope for African development today. China’s economic cooperation with African countries, and its investments on the continent were unflinchingly portrayed as being of mutual benefit and an act of solidarity between countries with a common experience of colonialism. Cuba, Venezuela, China –as states – clearly seem to be needed for the brand of internationalism embodied by the ideological heirs of Eastern and Central European Stalinism. In addition to, and complementing the state-centred solidarity serious questions arose for me noting the absence of contemporary young protest and democracy movements across Africa during the conference. The day-long event passed without any mention whatsoever of any of the significant protest movements that have taken to the streets (and to social platforms) from Burkina Faso and Senegal in the West to South Africa and Namibia in the South (to mention just a few). How on earth, one has to ask, can a conference that claims to “question power” on the continent ignore the popular movements, mostly of young people, against authoritarian regimes, against enduring racism, austerity, and myriad forms of social inequality? What kind of internationalism can be silent about young Africans and their demands and desire for social justice? Whose power is not questioned? The Rosa Luxemburg conference left me with many questions. Heike Becker is a regular contributor to the www.roape.net. As a writer and scholar. she directs research and teaching on multiculturalism and diversity as Professor of Anthropology at the University of the Western Cape in South Africa. Featured Photograph: The Internationale projected on a screen during the conference (Heike Becker, 13 January 2018).